Have you heard about Beachbody’s healthy snack, made for picky kids and pickier parents? It’s called Daily Sunshine, and we think you’re going to love it. But if you’re a picky parent, we know you’ve got questions. And we’re here with answers! Daily Sunshine is a healthy 3-in-1 smoothie for kids that’s been designed specifically for their unique dietary needs. We know how hard it is to get kids to eat right, so our goal was to not only create a healthy snack you feel good about them having but also to make an easy snack that they’ll actually ask for. 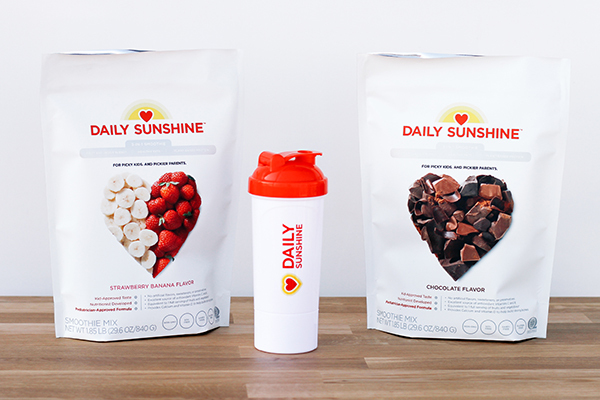 The Daily Sunshine smoothie comes in two flavors: smooth and creamy Chocolate and fruity and sweet Strawberry Banana. Each is made with organic fruits and vegetables,* organic pea protein, and healthy fats, and has 3 grams of fiber, probiotics from Bacillus coagulans, vitamins C and E, calcium, and vitamin D.
Here are Daily Sunshine’s Strawberry Banana Nutrition Facts label and Daily Sunshine’s Chocolate Nutrition Facts label so you can check them out yourself! In short, Daily Sunshine has been carefully formulated to include the building blocks of nutrition kids need to help them grow up healthy and strong, and 4 out of 5 pediatricians approve its formula. The ingredients in Daily Sunshine differ slightly depending on which flavor you choose. But both the Chocolate and Strawberry Banana flavors have a fruit and veggie blend of apple, sweet potato, flaxseed, spinach, blueberry, acerola cherry, and strawberry. We were just as careful about what we didn’t put in Daily Sunshine as we were with what we did put in there. That’s why Daily Sunshine is soy-free, dairy-free, gluten-free, and non-GMO, and it contains NO artificial flavors, sweeteners, or preservatives. Get Daily Sunshine here! Why is Daily Sunshine for kids ages 4 and older? The FDA established the general Recommend Daily Intake (RDI) based on children and adults 4 years old and up. Daily Sunshine was designed with the needs of this group in mind. While Daily Sunshine is a food (like cereal, snack foods, almond milk, etc. ), children under the age of 4 are considered infants and toddlers who have their own specific dietary needs. Just like other food choices, parents should make their own decisions based on their unique child and information from their healthcare provider. How many grams of sugar are in each serving? There are 7 grams of sugar in Chocolate and 8 grams in Strawberry Banana. To put this into perspective, there are 14 grams of sugar in a banana and 19 grams of sugar in an apple. The 4 to 5 grams of naturally occurring sugar in Daily Sunshine come from ingredients in the product, like fruit powders. That leaves 3 grams of added sugar from organic cane sugar. That’s 12 calories, or ¾ teaspoon, which is only 6 percent of the Daily Value for added sugar. Organic cane sugar is the third item on the ingredients list, so why does it also contain stevia? Without stevia, which is a plant-based sweetener, Daily Sunshine would need to contain much more added sugar to deliver the same kid-approved taste! We made a conscious effort to keep added sugars low while satisfying the taste buds of our pickiest eaters. To learn more about why and how much organic cane sugar is in Daily Sunshine, check out this FAQ. Is there caffeine in Daily Sunshine? Chocolate Daily Sunshine has organic cocoa powder and natural chocolate flavor. Because caffeine is a constituent of cocoa and chocolate, Chocolate Daily Sunshine may also have some caffeine — but in very small amounts. To put this into perspective, according to the USDA, a cup of hot chocolate (made from cocoa) contains five milligrams of caffeine, while a cup of brewed coffee contains 95 milligrams of caffeine. If you have concerns about low levels of caffeine, you may want to use Strawberry Banana Daily Sunshine. Where is the natural chocolate in Daily Sunshine derived from? The natural chocolate flavor in Daily Sunshine is a secret recipe containing cocoa, vanilla bean extract, and other tasty ingredients — a delicious blend crafted for chocolate lovers! Is it safe for kids with celiac disease or peanut/tree nut allergies? In addition, there are no peanut or tree nut ingredients in Daily Sunshine, and we take significant precautions to prevent any nut-based ingredients from being included in the product. Every lot of Daily Sunshine is tested for gluten to ensure the product meets this gluten-free standard. In addition, we follow strict FDA Good Manufacturing Practices in creating Daily Sunshine, which includes thorough cleaning and sanitation of all equipment and surfaces the product comes in contact with prior to producing Daily Sunshine. However, because some consumers may have extremely sensitive reactions to major allergens, such as gluten or wheat, Beachbody wants to be as transparent as possible. This is why we include a statement which you see on many food products today — that Daily Sunshine is made in a plant that also processes eggs, fish, crustacean shellfish, tree nuts, peanuts, and wheat ingredients. We do this so that anybody who has an extreme reaction to any of the listed ingredients should have as much information as possible, and if they have concerns, they should first consult with their physician before trying a new product. If you’re a busy parent you’ll love that Daily Sunshine smoothies are quick to prepare. Simply mix one serving with 8 ounces of water, shake it up, and you’ve got a healthy, gluten-free, dairy-free snack. Sources say yes! Daily Sunshine has been rigorously taste-tested by the toughest critics… kids. We know how hard it is to help your kids eat healthy, which is why we worked hard to make Daily Sunshine a healthy smoothie that has a taste that’s kid-approved! 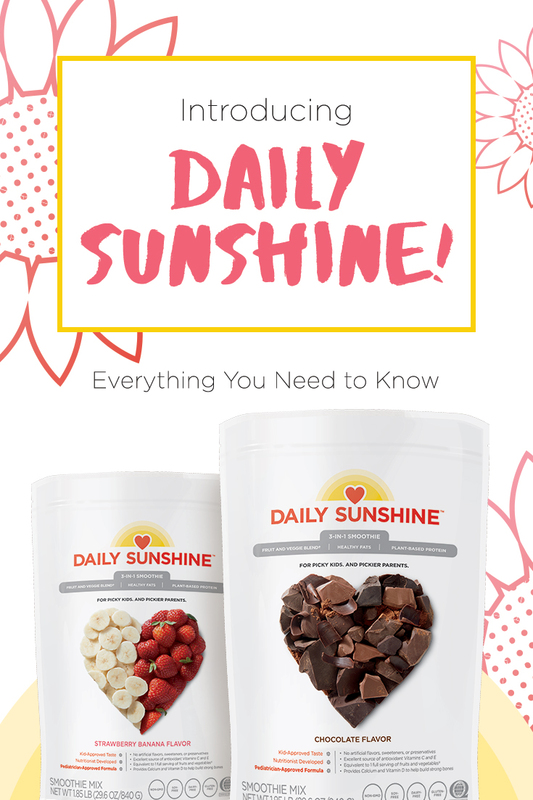 Daily Sunshine was designed to help curb junk-food cravings with fiber and 10 grams of protein. Kids can enjoy it in the mornings on the way to school, as part of their lunch, as an after-school snack, or even between soccer practice and music lessons. Daily Sunshine vs. Shakeology. What’s the difference? Daily Sunshine provides key nutrients in a simple yet healthy formula designed for young, growing bodies. Shakeology focuses on providing an array of exotic superfoods, adaptogens, prebiotics, digestive enzymes, and other important nutrients for adult bodies. While they both have unique ingredients, Daily Sunshine and Shakeology contain some overlapping essential ingredients, but at different levels, in order to suit the nutritional needs of kids and adults. Note: We do not recommend Shakeology for kids. Why does Shakeology count as 1 red container, while Daily Sunshine counts as ½ green, ½ purple, and ½ red? Shakeology contains between 16 to 17 grams of protein and between 140 to 170 calories per serving depending on the flavor. This makes it perfect for one red container. It also contains a vast array of other nutrients, but given how wide-ranging and exotic they are, they don’t fit as neatly into a specific container. Daily Sunshine, on the other hand, contains less protein (10 grams), so ½ red makes sense. It also contains the equivalent of a full serving of fruits and vegetables. * Because this is done using a combination of both types of produce, the most accurate representation is ½ purple and ½ green. We’ve got you covered as far as sizes go. There’s a 30-day supply bag, a box of 24 single-serve packets (single flavor as well as 12 of each flavor), and a four-serving Sampler Pack (two of each flavor). Get Daily Sunshine here!